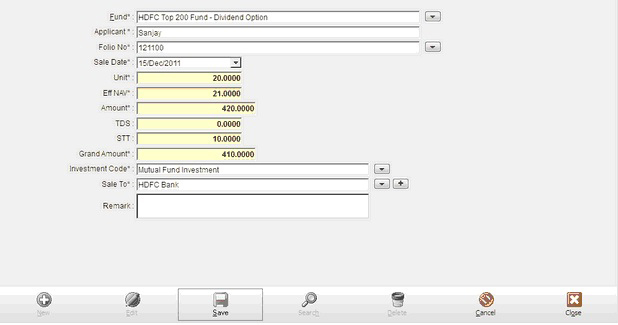 This module helps you fill up all the details of the mutual funds in which you invest , it contains entries of all the important details that you need to database for a M.F of sale. Applicant Current member name selected. Units Enter Unit of fund to sold. Amount Calculate amount show here. TDS TDS expense on sold transaction then enter here. STT Enter STT expense here. Investment Code Select stock Account. Sold to Select sold to account.